2. SESSIONS: ACTUAL Most practitioners have two options for increasing gross revenue: increase the number of sessions and/or increase the amount of revenue earned per session. We're going to set goals in both areas. Let's start by entering your actual figures for number of sessions and average gross income per session from last year so you know your starting point for setting goals. Your number of sessions should be one of the things you track as part your income tracking. Gross income per session is calculated by dividing your year-end gross income by your total number of sessions. 3. SESSIONS: GOALS Okay, we've gotten to the really important part of the process—setting realistic goals in the two areas that will affect your annual gross income: number of sessions and gross income per session. Evaluate and Plan Assuming you're trying to earn more gross income than last year (call me crazy), one or more of these figures has to increase from last year's numbers. You could also add an entirely new revenue stream—like retail product sales—but we're going to keep it simple for the FFFC. Examine both the number of sessions and average gross income per session to see how you can realistically increase these figures over last year. You may end up setting higher goals in one category or both. Start with your total number of sessions for the year. Compared to last year, can your schedule handle more appointments? 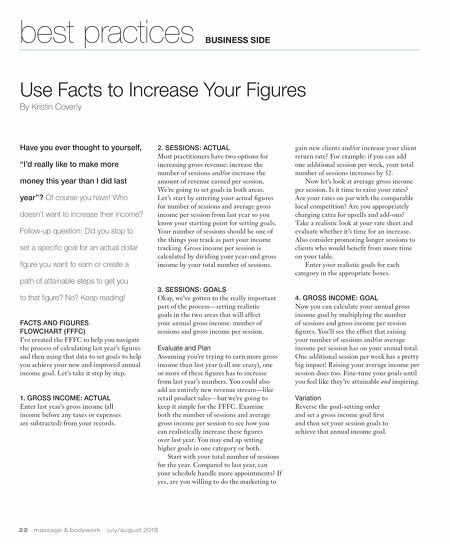 If yes, are you willing to do the marketing to Use Facts to Increase Your Figures By Kristin Coverly best practices BUSINESS SIDE 22 m a s s a g e & b o d y w o r k j u l y / a u g u s t 2 0 1 8 gain new clients and/or increase your client return rate? For example: if you can add one additional session per week, your total number of sessions increases by 52. Now let's look at average gross income per session. Is it time to raise your rates? Are your rates on par with the comparable local competition? Are you appropriately charging extra for upsells and add-ons? Take a realistic look at your rate sheet and evaluate whether it's time for an increase. Also consider promoting longer sessions to clients who would benefit from more time on your table. Enter your realistic goals for each category in the appropriate boxes. 4. GROSS INCOME: GOAL Now you can calculate your annual gross income goal by multiplying the number of sessions and gross income per session figures. You'll see the effect that raising your number of sessions and/or average income per session has on your annual total. One additional session per week has a pretty big impact! Raising your average income per session does too. Fine-tune your goals until you feel like they're attainable and inspiring. Variation Reverse the goal-setting order and set a gross income goal first and then set your session goals to achieve that annual income goal. Have you ever thought to yourself, "I'd really like to make more money this year than I did last year"? Of course you have! Who doesn't want to increase their income? Follow-up question: Did you stop to set a specific goal for an actual dollar figure you want to earn or create a path of attainable steps to get you to that figure? No? Keep reading! 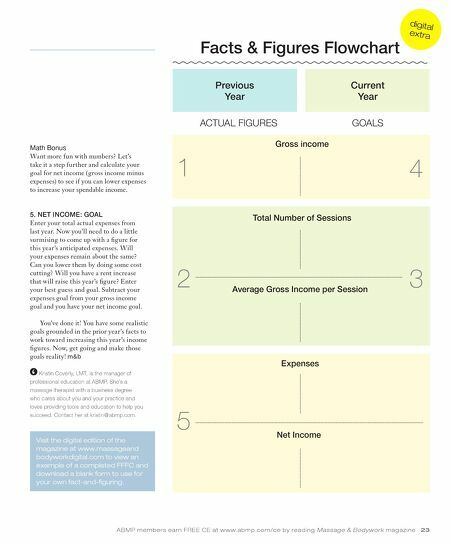 FACTS AND FIGURES FLOWCHART (FFFC) I've created the FFFC to help you navigate the process of calculating last year's figures and then using that data to set goals to help you achieve your new and improved annual income goal. Let's take it step by step. 1. GROSS INCOME: ACTUAL Enter last year's gross income (all income before any taxes or expenses are subtracted) from your records.